Memorial . Berles New Military Cemetery III. D. 1. His memorial, unveiled on 25th July 1920, stands outside the Royal Marines Museum at Eastney. At the age of forty four, Frederick William Lumsden was the oldest Royal Marine to be awarded the Victoria Cross (VC). Born on 14 December 1872, he joined the Royal Marine Artillery as a Second Lieutenant on 1 September 1890. After service afloat he returned to attended Staff College, specialising in signalling, gunnery, and musketry. He graduated in 1907 and went to Germany where he studied the language for six months to obtain a First Class Interpreters Certificate. In 1915, he was appointed to command the Royal Marine Artillery Howitzer Brigade, that consisting of twelve 15? howitzers, but whilst in France he took up an appointment as General Staff Officer on the First Army staff. On 2 April 1917 as part of a general attack of 14th Brigade against the Germans in the Holnon Wood sector, the 2nd Battalion Manchester Regiment captured a battery of six M1916 77mm field guns, south east of Francilly, but had suffered fifty-percent casualties and could not hold or remove the guns. The German retreat managed to evacuate the remaining artillery in the area, with the exception of this battery. On the night of 3 April Major Lumsden was placed in charge of a party from the 15th Highland Light Infantry and some Royal Artillery gunners with limbers and horses, to bring in the guns. Personally leading three sorties under barrage and machine gun fire, he successfully brought back all the guns, having to drive the Germans back from recapturing the final gun in the process. For his bravery and devotion to duty he was awarded the VC on 8 June 1917 that he received from King George V the following month. Just under a year later he was shot through the head in a forward trench and is now buried in Berles New Military Cemetery, France. 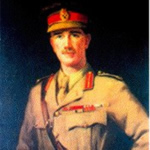 Quite apart from the bravery recognised for his VC, Major Lumsden also earned the Distinguished Service Order with three bars before his death. On 25th July 1920 the memorial to Brigadier General Lumsden was unveiled at Eastney, and is now in the Museums? memorial garden. The Museum purchased the medals in April 1973. An extract from The London Gazette, No. 30122, dated 8th June, 1917, records the following:-For most conspicuous bravery, determination and devotion to duty. Six enemy field guns having been captured, it was necessary to leave them in dug-in positions, 300 yards in advance of the position held by our troops. The enemy kept the captured guns under heavy fire. Maj. Lumsden undertook the duty of bringing the guns into our lines. In order to effect this, he personally led four artillery teams and a party of infantry through the hostile barrage. As one of these teams sustained casualties, he left the remaining teams in a covered position, and, through very heavy rifle, machine gun and shrapnel fire, led the infantry to the guns. By force of example and inspiring energy he succeeded in sending back two teams with guns, going through the barrage with the teams of the third gun. He then returned to the guns to await further teams, and these he succeeded in attaching to two of the three remaining guns, despite rifle fire, which had become intense at short range, and removed the guns to safety. By this time the enemy, in considerable strength, had driven through the infantry covering points, and blown up the breach of the remaining gun. Maj. Lumsden then returned, drove off the enemy, attached the gun to a team and got it away. France & Flanders covers all the dates and corresponding locations which are outside the official battle nomenclature dates on the Western Front. Therefore the actions in which these men died could be considered 'normal' trench duty - the daily attrition losses which were an everyday fact of duty on the Western Front.